Weight indicator/ repeater with large matrix display composed of very intense bright LEDs. Particularly suitable for use outdoors, also in full sunlight, and where it's necessary to view from a distance at any angle. Case completely in IP68 stainless steel. CE-M approvable (OIML R-76 / EN 45501). Large 6-digit display, 60 mm high, with very efficient SMD LEDs (software adjustment of the brightness intensity), complete of 6 Leds for indication of active functions, visible from over 25 m, with viewing angle up to 120° and with power up to 750 mcd. IP68 stainless steel case complete of wall fixing bracket. Max. 10.000e or multirange 2 x 3000e @ 0,3 µV/d in CE-M approved version for legal for trade use. Max. 1.000.000 displayable divisions viewable with internal resolution up to 3.000.000 points. Up to 8 signal linearisation points with DINITOOLS. A/D 24 bit sigma-delta 4-channel conversion, max.200 conv./sec. with automatic selection. 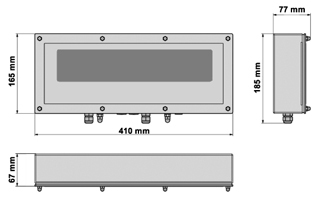 Management of a weighing system with up to 4 cells with digital equalisation or management of up to 4 independent weighing systems. Fitted with an air valve for regulating the humidity and the pressure inside the indicator. RS232/C bidirectional port configurable for connection to printer, PC, or other external units. RS485 bidirectional port configurable for connection to PC, PLC, or other external units. 2 photomosfet outputs: 150 mA 48 Vac / 150 mA 60 Vdc (NO), with configurable functions. 2 optoisolator photocouplers: 12÷24 Vdc, 5 mA min - 20 mA max, with configurable functions. 16-bit analogue output (DGT60AN model) 4-20mA / 0-5Vdc / 0-10Vdc at choice; maximum applicable voltage: 350 Ohm; minimum applicable voltage resistance: 10 kohm. Version with specific program for use of the indicator as a universal weight repeater or as a multi-scale repeater (MASTER) in combination with DFW/DGT/MCW. DGT60BC-1 Weight indicator with 60mm LED display. IP68 stainless steel case, 5-key keypad, and air valve for regulating the humidity and the pressure. DGT60AN-1 Weight indicator with 60mm LED display and analogue output. IP68 stainless steel case, 5-key keypad, and air valve for regulating the humidity and the pressure. DGT60PB-1 Weight indicator with 60mm LED display and Profibus. IP68 stainless steel case, 5-key keypad, and air valve for regulating the humidity and the pressure. RSCBPC RS232/C cable l=1,5m with PG9 and wires for terminal board. RSCB5 RS232 cable l=5m. For the connection of the weight indicator to a weight repeater, without connectors. RSCB10 RS232/C cable l=10m. For the connection of the weight indicator to a weight repeater, without connectors.